INDONESIA IS THE ONLY great cruising destination on the planet that straddles the equator, which means you can enjoy the wonders of this magnificent country at any time of the year. Sitting at under 10 degrees either side of the equator, Indonesia is immune to typhoons in the north and cyclones in the south. Even the trade winds have volcano-studded islands as windbreakers, with the best destinations found on the leeward side. Despite its vast open spaces, Indonesia is a less-rugged destination than elsewhere in the Pacific for those who choose to holiday at sea. into the spacious wide-bellied cargo hulls. While trailblazer boats such as Pindito and Seven Seas focused on dive expeditions with lots of guests, others began to emerge that minimised guests and maximized luxurious space. Ikan Gurami was one of the first. This sunken vessel was spotted in Badas harbour in Sumbawa by Jimmy Blee (co-founder of Asia Pacific Superyachts Indonesia) while evacuating guests from nearby Amanwana resort in 1999. The Suharto overthrow was in full flight. Jimmy was able to buy the cargo boat for the cost of a one-way ticket out of Jakarta from the terrified Indonesian-Chinese owner. Once she was floated with the help of the Amanwana staff, he set did a basic fit out and she became the boat of the Aman Komodo Experience. Some months later, she sat in the stunning national park awaiting her first guest. As the floatplane landed nearby and the tender was dispatched, Blee was below decks trying to keep the water in the bathrooms going. When he emerged to meet his guest, he was a little taken aback to come face-to-face with Princess Diana. Despite some rugged finishings, the Princess loved the experience and there soon followed an A-list line-up for this slightly B-list boat. But the experience was what mattered, and Indonesia had it in spades. Silolona picked up where Ikan Gurami left off, taking it to another level. This classic luxury sailing phinisi took everybody by storm when she was launched in 2004. A warm crew and great food joined her stunning finishing and comfort. A legend was born and Silolona and her sister Datu Bua continue to lead the charge to this day. 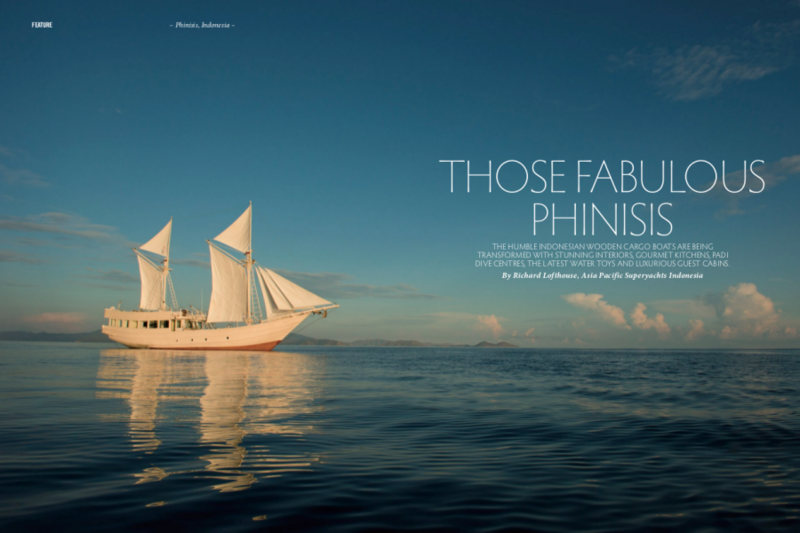 What the phinisi lacks in hydrodynamics, she makes up for with romance – the feel of warm teak in the late afternoon as you laze on the foredeck; the sound of a guitar being strummed by the crew; dolphins leaping around the bow; sunsets over volcanos; the fire of a beach barbeque on a strip of sand with not a soul around; a land that time forgot. There is no better way to see Indonesia. I have explored the Spice Islands on board Amanikan, the infinitely more comfortable and updated big sister of Ikan Gurami that was also built by Blee. I felt like I was back in the 1800s, when these islands boasted a commodity more valuable than gold: nutmeg. The history is there in the walls of the old fort and the old Governor’s house. It is in the note etched into the glass by the Dutch Governor Jan Coen. It is in the faces of the people, the eldest of whom still speak Dutch. Further north is Raja Ampat in Western Papua. Boasting possibly the most bio-diverse marine environment on the planet, this area has been capturing the imagination of marine biologists, divers and environmentalists for years. It has recently seen a surge in tourism as people come to see if it can possibly be as amazing as the photos. Fact: Raja Ampat is even more amazing than the most amazing photos you have ever seen. This influx would normally be a concern, but in an area that spans more than 3,000 square miles, overcrowding is never a problem. Join your phinisi in Sorong and head out into one of the last true wildernesses on the planet, all in comfort and warm Indonesian hospitality. As the market matures, a pattern emerges. First come the private yachts. Then come the local charter boats. Then emerges a better class of charter boat. The phinisi has filled this pattern until now. With wood becoming scarce and thus expensive, the long-term future of the phinisi as a luxury charter boat is diminishing. It is my opinion that the best ever constructed have already been built: Silolona, Amanikan, Alila Purnama, Amandira, Dunia Baru and Mutiara Laut are my personal favourites. There’s also Alexa, a phinisi designed especially for two people to enjoy on a romantic holiday. The 65.2m Lamima built in Sulawesi was launched a few months ago. The day will come when more modern boats step up and white hulls and dragons meet. Some of the romance will be lost, but the experience will always remain. My advice is to leapfrog everything else on your ‘Things to do before...’ list and put ‘Cruising Indonesia on a phinisi’ right up at the top. Nothing else compares. Nothing.